I am such a moron. I cannot believe that after all these years I did not figure out that I could get my wife, The Mindboggling Mrs. Miyoshi, to watch, or at least tolerate, the NCAA Men’s Basketball Tournament games on TV. All I had to do was give her a bracket to fill out. The Mindboggling Mrs. Miyoshi does not like sports on TV. She can watch golf and maybe curling, but in most of the other televised sports, the crowd noise is too much for her. I do not mind a TV sports ban though, because I would much rather participate than watch other folks play. So for most of the year, we do not worry that the kids are the biggest users of the TV (for video games). But during March Madness, I would like to watch at least a few games. More games than my wife would like. Part of the problem with the tournament games is that many are played on Thursdays. The first widely televised round (now called the second round due to the growing number of play-in games) has games on Thursday nights so The Mindboggling Mrs. Miyoshi really did not like March Madness. That is because Thursday night is our TV night. We used to watch Friends and ER on NBC, but now we watch The Big Bang Theory and CSI on CBS. Either way, my wife would hate to have her schedule interrupted and would rant about what a waste it was if I even thought about watching a game. If I did tune into a game, her fuming would sometimes lead to her leaving the room completely and leaving me to wonder what revenge she was plotting for my choosing basketball games over spending time with her. Consequently, I did not watch many basketball games during March Madness in years past. This year, I had my son, Thing 2, do all my picks for our bracket at work. We do not play for money, just bragging rights. Honestly. No money changes hands; we just want to see if we can unseat last year’s champ, who by the way, has been champ for two years running. I figured that letting my son fill out my bracket would be a good way to give him some interest in the games since he does not really like to watch sports on TV any more than anybody else in the family. Besides, I figured that he could not do any worse than I usually do. If his picks got me out of being in last place (for more than a decade), I would be ecstatic. Naturally, I did my own bracket too. Then, in an apparent stroke of genius, I printed out a bracket for everybody in the house. I left the brackets and the newspaper with all the comments from the pundits on the table so everybody would find them on Tuesday morning before the tournament began. The Mindboggling Mrs. Miyoshi went crazy. In a way that I did not anticipate. She had her picks done by the time I got home and was crowing and trash talking like she does any time we play games together. Only worse. “I can’t believe you picked that team to win. My team is going to win. Who would choose so and so?” And on and on. It was great! I know she is competitive, but who would have thought all I needed to do was give her a bracket and the game would be on? Naturally, everybody is thinking that I should have known it would be like this. After all, The Mindboggling Mrs. Miyoshi and I have been together for a long time now. Sometimes it feels like forever. So I should know what makes her tick. And usually, I do. But I did not think that her competitiveness could get a few more basketball games on our TV set during March Madness. Which brings me back to my initial statement. 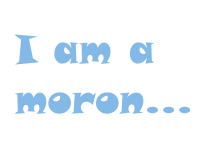 I am a moron. I am a moron for not figuring out years ago that my wife just needed to have a vested interest in the games to get a few on the TV. I am a moron for not seeing that competitive nature as a way to manipulate the situation. But I will not be a moron for telling the world my next step in watching a little more sports on TV in the future. I am glad that The Mindboggling Mrs. Miyoshi has gotten a little crazy during March Madness this year. I am glad that it is the right kind of crazy. I do not mind a little trash talking and strutting around when her teams win. As a matter of fact, I hope that she does win our little home competition. (At the time of this writing, a weekend before the final four, I already finished in dead last at home. Thing 2 has won and The Mindboggling Mrs. Miyoshi finished second.) Then, she will be sure to participate next year and we will get to watch a few basketball games. And maybe, if I am lucky, I can get her to pick some college football game winners. Then, we will see how much of a moron I really am.